The Blackhawks sat most of their stars on Thursday night in Anaheim and the results reflected it. The Hawks put 37 shots on net but didn’t get a single one past John Gibson. The Ducks easily handed the Hawks a 4-0 loss. Jonathan Toews, Marian Hossa, Duncan Keith, Brent Seabrook, Niklas Hjalmarsson, Artem Anisimov and Vinnie Hinostroza were scratches. Meanwhile, the Frozen Four was taking place at the United Center and two Blackhawks prospects were in action. 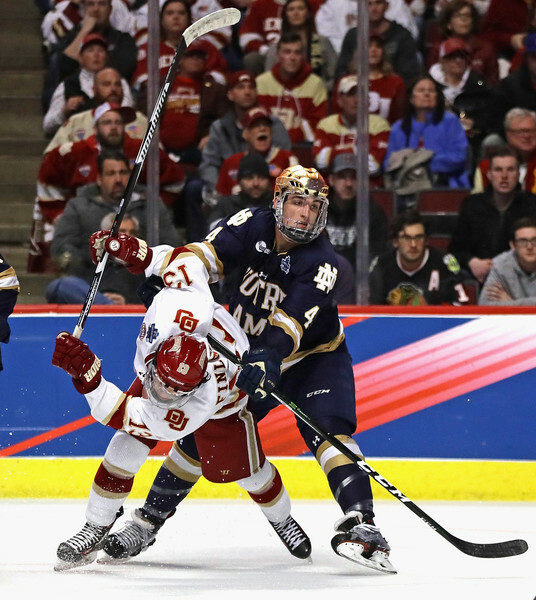 In the nightcap, defenseman Blake Hillman and the University of Denver devastated defenseman Dennis Gilbert and Notre Dame 6-1. 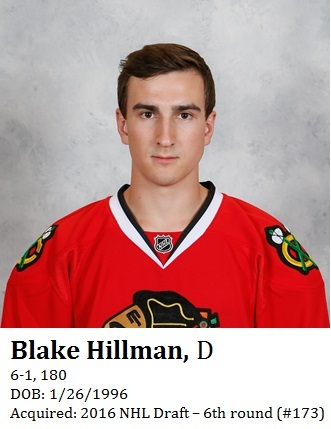 Hillman, 21, was credited with five shots on net for Denver. He posted one goal and six assists in 41 games this year for the Pioneers, who advance to play Minnesota-Duluth in the championship game on Saturday. Gilbert, 20, had a few massive hits in the game that momentarily sparked the Irish, but Notre Dame did very little right. He was credited with four blocked shots in the loss. Gilbert had 22 assists in 39 games as a sophomore, and uses his 6-2, 220 frame well and with ease. It’s looking like the end of the ’15 regular season. Da Hawks lost 4 in a row and looked hapless. Hopefully the post season ends just like ’15. Bring me the head of Corey Perry. Weasel. Cory played a stellar game . Liked our new look D pairings ,.,.T.V.R and Campbell looking solid , only being out worked and man handled a few times .Lead us to the Silver Cup . Rosi was swift of foot and had a great rest in the box for some jolly good lazy hooking . Did`t miss Toews at all ,.,.not with the new wun dare????? ?Hayden in the line up tonight . He is developing into a nice 4 -6 minute player . Rest my friends,.,,.,,. Rest ,.,.don’t let it besiege you ,for time is calling upon you . An NHL exhibition hockey game in which the home team won, nothing more. No analysis really needed. Oh except Forsling looked taller than I remember. 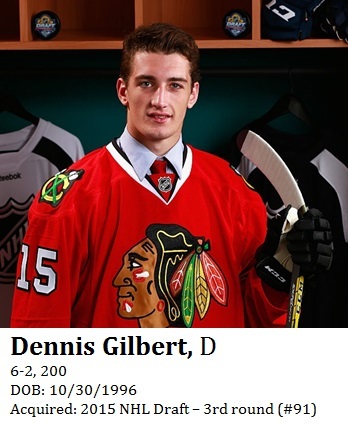 Sadly my fellow Tonawanda, New York native Dennis Gilbert, whose son plays for Notre Dame, did not fare well. The overall team effort was much better than the game against Colorado until the Duck scored their 4th goal which sucked the effort right out of them. So, not disappointed in the game and grateful we came out healthy. I thought the 4 rookie forwards played well and Hayden-Schmaltz-Hartman played a few shifts together and looked good with a few nice plays and a couple chances. I’ll just say this about Rozsival – he got screwed on that penalty call where he knocked Kesler down – that wasn’t a penalty, plus he made a couple nice plays in the offensive zone. But … I hope we do not see Rozy in a playoff game … please. I thought Forsling played OK except for his brain cramp giveaway when he froze and stood there with the puck for a couple seconds before dribbling the puck to a Ducks player leading to one of their goals. My biggest concern heading into the playoffs are the special teams. Can the Hawks win the Cup with their PP and PK? The PP more times than not gives the other team momentum and sometimes more better scoring chances than the Hawks get themselves. The PK strategy used by the Hawks neither stops the other team from scoring at an acceptable rate nor does it pressure the puck to open up possible shorthanded breakaway chances for the Hawks. I think the Hawks have scored only 1 shorthanded goal this season and have very few breakaway chances on the PK. Meanwhile, the PP has given up 7 shorthanded goals and many other breakaway chances for the other team where their shorthanded bid was stopped. The Hawks usually draw more penalties then they take. This season the discrepancy is smaller than in past season – at 21 – where the Hawks have been on the PP 227 times and on the PK 206 times (3rd fewest in the league). But the Hawks have given up 45 goals on the PK while scoring only 42 on the PP. So they had 21 more PP chances and scored 3 fewer goals. It’s even worse if you factor in short handed goals where the goals for would be 43 (42+1) and goals against would be 52 (45+7). In other words they have had 21 more chances on the PP than they gave the other team and yet they’re a -9 in scoring. PP has to be better/or were not showing cards for entrys. In 13 or 15, like BOS did in 11, PP wasn’t that good and PK was really good. Throw out the 15/30 and PK is pretty good. ER to try to quote one Scotty Bowman accurately ” give me a hot goalie and a hot pp and I like my chances of winning”. Worked pretty well for him i would say. I was thinking same thing about 38,8 and 40 if you needed a spark during playoffs and move Hossa up with Toews or even with 72 and 15 and Kane with 19 and 14. Leaves 16 and 67 to anchor 4th line. Self preservation game. Anybody who is fool enough to critique the last week of game’s as precursor of how playoff hockey will shake out for the Hawks is being silly. ^ to Rufus’ point, last night is exactly why it drives me crazy that the Hawks have to play the group of lumberjack assclown goons in Anaheim so late in every season. Corey Perry is clearly looking to do nothing more than injure Ryan Hartman. He did it to Calgary a week ago. If Major League Baseball allows teams to avoid throwing 4 pitches for an intentional walk, the Blackhawks should be able to not even skate a team against the Ducks this late in the year. They aren’t worth the risk. Erie outshot London 46 to 12 and lost 2 to 0?? Praise to Q for resting the big boys. This team knows what it takes to win 16 games in the playoffs. They are under fire from some people for not being “focused”. They’re focused and they are ready. Get out of LA healthy and ready to drop the puck on Thursday. TAB, So you are really human cool it. If you love Perry so much what is your thoughts on Brad Marchand? The Hawks could see him in the finals. Penn State didn’t get bounce and a cross bar before that then Denver got a bounce, could have been PSU 1 or 2-0 then it would have been 4-4 or 5-5 type of game. Interesting if any other teams can do better against them then PSU did.